In My Language is an Unpaved Road (Crystal Bridges), the collaborative duo of Henning Fehr and Philipp Rühr documents the eponymous art museum – the Crystal Bridges Museum of American Art – opened in 2005 in Bentonville, Arkansas, by Alice Walton, heiress of the Walmart fortune. 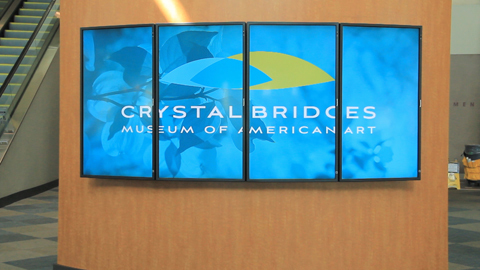 Funded by the world’s largest department-store chain, Crystal Bridges exemplifies a shift in the function of museums from educational to entertainment models. The film explores not only the museum’s collection, which ranges from early American colonial to contemporary art, but also the individuals around it. Co-director Fehr acts the part of the museum’s director, Don Bacigalupi, while the rest of the cast are actual interviewees, including local donors and high-school teachers. As German critic Noemi Smolik writes in Frieze d/e, “The film comes across as both touchingly naïve and cunning – naïve in its direct voicing of the protagonists’ stories; cunning, because of the parodic effect given to these stories by the film’s imagery.” Henning Fehr, andPhilipp Rühr. 2013, Colour, HDCAM, 92mins, Germany. Henning Fehr was born in Erlangen, Germany, in 1985. Philipp Rühr was born in Brühl, Germany, in 1986. Both currently live and work in Düsseldorf, Germany. They are represented by Galerie Max Mayer.